There’s nothing like the beauty and majesty of timber frame construction. With its ability to elegantly traverse breathtaking expanses and perfectly complement nearly any decorum, the time-honored look and enduring permanance of timber has no equal. 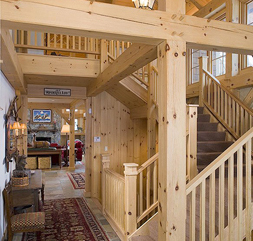 For over 25 years, Woodhouse has been the name in custom timber frame homes. Featured in national magazines, the Woodhouse design team has been involved in some of America’s largest and most ambitious commercial timber frame projects, including the Adaptive Sports Foundation facility at Windham Mountain. Brainard Ridge Associates proudly involves the timber frame expertise of Woodhouse in the construction of our custom timber frame homes, as well asin many of our commercial developments. For more information, please visit the Woodhouse Timber Frame Company’s website.